Want to take a single window and make it full screen on a Mac? This is a fairly common activity for Mac users, particularly if they’re used to the Maximize window button on a Windows PC. It turns out there are a few ways to accomplish the maximization of windows on Mac OS, it’s a deceptively simple task on a Mac, as the two methods we will discuss here are quite different from one another. One approach to taking a window full screen in Mac OS relies on what’s known as Full Screen Mode, which turns an application window into it’s own separate workspace by maximizing a window to take up the entire screen. This method removes the menu bar from the top of the screen (until it’s hovered over with a cursor), and removes all traditional window elements when in full screen mode, thereby hiding the window titlebar, close button, minimize and maximize buttons, and does not allow for other app windows to appear on top of it. The other approach is literally making a window take up the full screen, but it still maintains that window as a window rather than a dedicated space. This allows the menu bar to stay persistent visible, the window title bar to still be visible along with the close button, maximize and minimize buttons, the sizing handles, and it still allows for other windows and apps to tile onto the window too. By making a window take up the entire screen, it does not become it’s own space the way that the aforementioned “Full Screen Mode” does. The first approach we’ll cover is how to literally make a window take up the entire screen on a Mac. This is not the same as “Full Screen Mode” which we will discuss separately. This is the easiest way to make a window literally take up the entire screen, without losing its underlying functionality as a window. And yes of course you can also just manually drag the window around on screen into a corner and then resize the opposite corner to drag it to take up the entire display, but that’s going to be as fast for most Mac users. Another nice variation of this trick uses window snapping to put multiple windows alongside one another, sort of like a split screen view but while maintaining the capabilities of standard windows, and allowing for far more than just two window panels side-by-side. 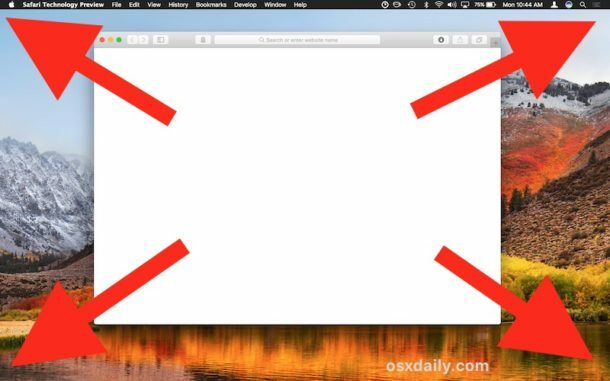 You may already be familiar with what’s known as Full Screen Mode, which is the default result of clicking the little green button in a windows title bar in all modern Mac OS versions. There isn’t much to using Full Screen Mode, just click the green button in a windows titlebar and you’ll send that app or window into full screen. With Full Screen Mode, an app or window becomes a dedicated space that you will see through Mission Control. Full Screen Mode hides the window titlebar and menu bar on a Mac, and to see either of those you must take the cursor to the top of the screen to reveal those buttons and menu items again. The primary disadvantage to Full Screen mode is that it may be difficult to multitask with more than one app at a time, though using Split Screen View in Mac OS can help that by placing two full screened apps side-by-side. 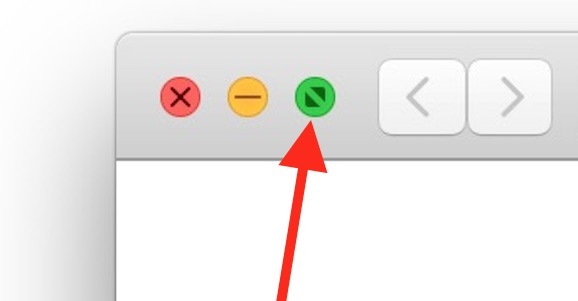 Exiting full screen mode on the Mac is accomplished by bringing the mouse cursor near the top of the screen and then clicking on the green button again. Again, this is Full Screen Mode, which is not the same as simple enlarging a window. You can resize a window to take up most of the screen, or you can take a window into Full Screen Mode, each are unique. Longtime Mac users may recall that the Green button in the window titlebar used to function more as a maximize toggle rather than Full Screen toggle, and if you miss having that capability you may be pleased to discover you can still maximize and zoom windows with the Green button without entering full screen mode by using a key modifier before clicking the green button. But, don’t expect the maximize feature to work quite like it does on a Windows PC, as it does not necessarily take the entire window full screen, and if often just enlarges the window so that it hits the top menu bar and the bottom near the Dock, but without expanding horizontally. Sort of curious, but that’s just the way it works. There’s no right or wrong way here to full screen a window on the Mac, it’s just a matter of personal preference and what you’re aiming for. Some people may not like different spaces or they want the ability to interact with the other applications in a tiling fashion, thus full screen mode may not be appropriate. On the other hand, some people like the distraction free environment offered by full screen mode, and thus they’d prefer that approach. Use what works for you. If you enjoyed these tips, you’d probably also appreciate learning some simple window management keyboard shortcuts for Mac OS. Have any tips or tricks for full screening windows on a Mac? Share them in the comments below! Option-clicking the green zoom button is significantly easier. “Magnet” is a great app for maximizing screen on Mac. It is not free but pretty good value too me because I use it every day. Couldnt agree more. Used Bettersnaptool for a long time and just switched to Magnet. Great tool. and for $1 its practically free. Keyboard sequence to make full screen on Mac. Use the same keyboard sequence to exit full screen. Does anyone on the internet ever bother reading the articles? Everyone is talking about full screen applications, but the article is talking about full screening windows. There is a difference. All this can be accomplished by following what this older OSXDaily article informs you. Hold alt and double click any corner of the window will maximize it completely. I’m a convert to macOS of about 2 full years now after having spent decades in Linux and Windoze. I consider window management one of a few areas where macOS is deficient, overly complex, and kludgy. I’m very thankful for the Magnet app which restores sanity to window use under macOS. I remain puzzled why macOS has such strange ideas about when people want to do with windows such that almost anyone familiar with other popular Oses finds it frustrating and requires an add-on to get by. Hold down the OPTION / ALT key on the Mac keyboard and double click one of the corners of the window will maximize it. I have been using my apps full screen since OS X Lion. It works best when using a trackpad since we can use a multitouch gesture to slide between full screen apps. There is a far simpler solution given actually by OSXDaily years ago. I was just wondering if there is any way to make all my windows full screen by default. I always press the green button in the top left corner and it’s a bit of a pain to do it every time I open a new window. You can click Control, Command, and F at the same time and it it makes it fullscreen. I don’t know how to make it by default, though. Hope this helps! If you have a Logitech mouse or better touch tools that allows you to set buttons on the mouse to perform a keystroke, you can assign one to trigger whatever keystroke you programmed your magnet maximize window command to be. So I have a logitech G703 with the typical 2 side buttons and I use the one closest to the front of the mouse to maximize windows and the other one triggers the command + M keystroke to minimize windows.